Most people would expect purchasing a gas range is straightforward. Unfortunately, this is not the case. Please Note: Do not buy an “off the shelf” gas range for your kitchen if you live off of the grid or use a generator to run your home. They use an electric glow plug to light the oven. This glow plug can consume 400-800 watts the entire time the oven is on. If you buy your gas range as a backup for power outages, these glow plugs will not operate without power. The oven cannot be lit with a match. 1. The oldest type of gas ranges have burners that are lit with a match or some type of lighter. This type is very efficient but inconvenient. 2. Another style of gas range uses pilot lights to lite the burners. These pilot lights are just tiny flames located close to the main burners that burn 24 hours a day so the main burners will light when their valves opens. 3. A more advanced type of gas range uses electronic igniters to lite the burners. These igniters are similar to a spark plug in a car engine. They make a small spark just big enough to lite the burners. This electronic ignition system only uses a watt or two and only for the few seconds the burners are being lit. Most of these ranges use the igniters on the top burners and some other type of lighter (pilot lights or glow pug) for the oven burners. Ninety nine (99%) percent of gas ranges sold in North America have the electronic type of ignition for the stove burners and glow plugs to light the oven. Glow plugs are essentially electric heating elements that glow red-hot to light the oven. They typically consume between 400 and 800 watts each and some ovens even have two of them (one per burner). These glow plugs are on the entire time the oven is on. This is different from a typical gas clothes dryer where the glow plug only operates for a few seconds to light the burner and then turns off. The glow plugs consume a lot more power than most homesteaders realize. Imagine baking for 5 hours at 800 watts. The result would be 4000 watt hours (4 kWh) consumed just to bake a turkey. The other downside of these glow plugs is the oven cannot be lit manually in the event of a power outage (from low battery voltage or lightning), making the oven useless. Off grid homeowners have few solutions to the glow plug problem. We can decide not to bake, buy an oven that uses pilot lights or use the only oven in North America that does not use glow plugs. This range uses a special electronic ignition system for the oven. Peerless Premier manufactures the only gas range that uses electronic ignition for the stove burners and the oven burner. The stove top is fairly normal in that the burners are lit by electronic ignition. However the oven is very unique. The oven is lit by their proprietary ignition system that uses a spark to light a pilot and then the pilot to light the main burner. When the oven is turned off, the main burner shuts down and a few seconds later the pilot turns off. No waste; no large energy consumption. When you turn the Peerless Premier oven on, a small amount of propane is released to make the pilot. This small amount of gas is lit by their proprietary electronic ignition system (consumes 1 watt). The lit pilot heats a thermocouple which opens the main gas valve allowing the main burner to lit. If there is no electricity you can manually light the Peerless Premier’s pilot with a match or lighter. Open over broiler drawer and find burner assembly. At the back of the burner (toward the rear) you will see a small tube where the gas exits to make the pilot. Turn the oven to your desired temperature. There will now be gas at the pilot tube. Hold a match or lighter at this tube until you see a nice blue flame. You are done. The Peerless will take care of the rest. The pilot will stay lit until you turn the oven off completely. If you want it to stay on just leave the oven temperature setting at the lowest setting (150 degrees F). Google “Peerless Premier” for more information. I used propane for years, and the old stoves lasted for years. While looking to buying a new one I discovered the oven lighting problem. It gets hot here in the summer, so turning of the pilot was usual, then lighting the oven with a match. Found out new propane stoves need electricity. That was a shocker after about 30 years with this stove. I’m glad to find out there are still some alternatives available. Hi, I had such a devil of a time finding just the right off grid stove I hope it will be beneficial to others to post my review here of my Premier battery-powered stove. I spent a long time looking and found very few reviews so I was pretty nervous about plopping down $1,200 on a Premier stove. I finally bought it from Lowes because they have a 30-day no-questions-asked return policy. I bought this stove a year and a half ago so I have a lot of experience with it. I searched long and hard to find a stove for an off-grid application and this is the only stove I found that met all my criteria. 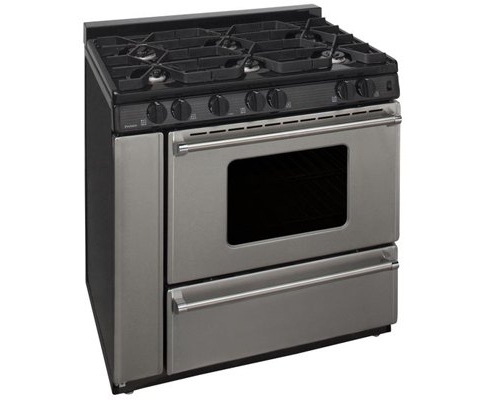 I wanted a stainless steel, battery-powered stove (this does not plug into the wall like 99% of modern stoves) with sealed burners and without a lot of little nooks and crannies on the stove top which would complicate cleaning. This stove meets all those criteria. It uses 8-AA batteries, which I expected I would have to replace every month or so, but in a year and a half I have not yet replaced them. We use the stove every day, do a lot of cooking, canning, and baking, and the batteries have not yet had to be replaced. There is no light inside the oven so the glass in the door is useless, but not a detraction. The only negative I can write about this range is that the stainless steel backsplash (back guard) is kind of “tinny” and not very thick material. But, you can’t tell just from looking at it and you only notice when you are cleaning it. So, not a biggie. While doing research before buying this stove, I read some complaints on other websites about the customer service department at the Premier headquarters, but I found them very courteous and helpful. The stove comes with the natural gas orifices installed so if you want this for propane you have to do the conversion. It is very simple and the instructions are laid out very clearly in the owners manual and the propane orifices come included with the stove. The largest burner is excellent for home canning or heating up a lot of water or large pot of soup or salsa in a hurry. I love this stove and would definitely buy another one. As a side note, we use two forty pound propane tanks and they last about four months each. Premier makes this same model as a plug-in so be sure there is a “B” in the model number indicating it is battery powered. Hey Jody, great website and I’m glad my review was helpful. One comment about manually lighting the oven. Just for curiosity sake I tried the manual light as you outlined in your article but mine wouldn’t light that way. The oven knob on mine has a “lite” setting. After turning to “lite” you have to push the knob in order to get the propane to start flowing. While depressing the know and holding a match or lighter, the pilot flame will ignite after a few seconds. I have to continue to hold in in for five seconds or so before the pilot flame will stay ignited by itself. Once ignited, then I can turn the knob from “lite” to whatever my desired oven setting should be. As a side note, since you have to watch the pilot light during battery ignition anyway, and since I’m already on my knees looking at it, I found it is quicker to just light it with a lighter than to wait for the battery-powered ignition spark to catch. I use one of those foot-long butane fireplace lighters and it’s quick and easy. Coming up on two years with our Premier range and we still love it and would buy one again. Thanks for sharing again. The 120 volt Stainless Premier model must be different. Just set the temperature, light the pilot and walk away. There is a thermocouple (heat operated switch) that has to heat up before the main burner lights. I have a Premier gas range which has a battery ignition. No electricity is hooked to it at all. I put it in before we installed the solar system and it just ran off a little propane tank that is was piped to on the outside of the building. If the batteries run out, you can manually start it with a match as in the old days, or just forgo the batteries and use a match all the time. Hi Jody: Really in love with your website! I came across Unique Off Grid appliances today during some research and am wondering if you have heard of them and have any opinion on the ranges or solar powered fridge? Would love to hear your thoughts. Thank you for explaining glow plugs and ovens. 400 watts is a lot of electricity for a gas oven to use. That’s like turning on 57 lights (led) and leaving them on for an hour to bake a potato. What a waste. Do you have any idea where I could find the older models with the Thermocouple spark ignition? Have you folks seen this model Premier BAK100OP? I thought it was an interesting option to have a battery ignition. Love your site. I plan on going off grid gradually starting this summer/fall when I move to Arizona. I’m buying some property and a travel travel for starters then building a “tiny house” while on site. Luckily my kids are all grown and I live alone so my energy needs and wants are pretty low. Thanks for your kind words. I am familiar with the Premier BAK100OP but I have not used that one personally. It seems relatively inexpensive and I like the idea of a battery ignition. No 120 volt AC required at all. I think you should go for it. Any one I have talked to say the batteries last a year or more using the stove everyday. If you decide to buy one give us a review or update and I will post it either here in the comment section or in the article itself. My personal email is jody@jodygraham.com . Firstly – love the site. Hope it’s still an active project, as I see you haven’t posted in awhile! I was looking at different models of the Peerless Premier gas ranges, and on the Home Depot website there are a fair number of unfavorable reviews citing durability and craftsmanship (enamel chipping, parts not fitting well, burners not going low enough to simmer, etc). Is there a particular model that you’ve used that you can recommend? Thanks for the kind words. It is still an active project. I have just been battling a chronic illness and it gets me down sometimes. I would avoid any of the enamel models of the Peerless Premier stoves and only choose the stainless models such as the P30 Stainless model. It is by far their most popular. Has sealed burners and the super high efficiency oven ignition system. Also has one huge power burner, two medium burners and a tiny burner for small pots or simmering. Been using ours for 12 years and would buy another one tomorrow if this one broke down. Take Care! Just saw your reply! Thanks much 🙂 I’m curious, if you wouldn’t mind sharing – does your family use propane or natural gas with your P30? If propane – how much would you estimate you use per month? We use propane with the Peerless P30. We are a family of six…two adults and four children, ages 8, 6, 3 and 1. We use about 18-19 pounds per month or 16-17 liters. This costs us about $8.50 to $9.00 as we are paying .52 per liter right now or $1.97 per US gallon right now. The last time I checked our range’s consumption was last fall. I did this by hooking a 20 lb tank for 30 days. After 30 days I had 1.5 lbs left over. Not very scientific but effective. Thank you for the kind words. In your about us page you mention that the Peerless was forced to change it system in 2011. Does that mean that there are no good alternatives for a gas range? Thanks for all of the great info on our site. Thanks for your feedback. The good news is that Peerless was able to come up with a solution to their mercury thermostat problem. They have made arrangements to recycle the thermostats when the range is worn out. This has changed the EPA’s mind and allowed Peerless to make their glow plug-less ranges. You can now buy the Peerless ranges and they are the same great system that has no pilot and no glow plugs. I need to make a change on this website to reflect this good news. If you have any questions please do not hesitate. We have lived off the grid for 13 years and made every mistake possible….